Dark Energy and the Accelerating Universe - J.A. Frieman et al. A diverse and ambitious set of projects to probe dark energy are in progress or being planned. Here we provide a brief overview of the observational landscape. With the exception of experiments at the LHC that might shed light on dark energy through discoveries about supersymmetry or dark matter, all planned experiments involve cosmological observations. Table 3 provides a representative sampling, not a comprehensive listing, of projects that are currently proposed or under construction and does not include experiments that have already reported results. All of these projects share the common feature of surveying wide areas to collect large samples of objects — galaxies, clusters, or supernovae. The Dark Energy Task Force (DETF) report [Albrecht et al. 2006] classified dark energy surveys into an approximate sequence: on-going projects, either taking data or soon to be taking data, are Stage II; near-future, intermediate-scale projects are Stage III; and larger-scale, longer-term future projects are designated Stage IV. More advanced stages are in general expected to deliver tighter dark energy constraints, which the DETF quantified using the w0 - wa figure of merit (FoM) discussed in the Appendix (Section 11.1). Stage III experiments are expected to deliver a factor ~ 3-5 improvement in the DETF FoM compared to the combined Stage II results, while Stage IV experiments should improve the FoM by roughly a factor of 10 compared to Stage II, though these estimates are only indicative and are subject to considerable uncertainties in systematic errors (see Fig. 16). We divide our discussion into ground- and space-based surveys. Ground-based projects are typically less expensive than their space-based counterparts and can employ larger-aperture telescopes. The discovery of dark energy and many of the subsequent observations to date have been dominated by ground-based telescopes. On the other hand, HST (high-redshift SN observations), Chandra (X-ray clusters), and WMAP CMB observations have played critical roles in probing dark energy. While more challenging to execute, space-based surveys offer the advantages of observations unhindered by weather and by the scattering, absorption, and emission by the atmosphere, stable observing platforms free of time-changing gravitational loading, and the ability to continuously observe away from the sun and moon. They therefore have the potential for much improved control of systematic errors. A number of projects are underway to detect clusters and probe dark energy using the SZE (see Sec.7.2). These surveys are coordinated with optical surveys that can determine cluster redshifts. The Atacama Pathfinder EXperiment (APEX) survey in Chile will cover up to 1000 square degrees. The largest of these projects are the Atacama Cosmology Telescope (ACT) and the South Pole Telescope (SPT), the latter of which will carry out a 4,000 square degree survey. A number of optical imaging surveys are planned or proposed which can study dark energy through weak lensing, clusters, and angular BAO using a single wide-area survey. These projects use telescopes of intermediate to large aperture and wide field-of-view, gigapixel-scale CCD cameras, and are deployed at the best astronomical sites in order to obtain deep galaxy photometry and shape measurements. They deliver photometric-redshift information through color measurements using multiple passbands. The ESO VLT Survey Telescope (VST) on Cerro Paranal will carry out public surveys, including the 1500 sq. deg. KIDS survey and a shallower, 5000 sq. deg. survey (ATLAS). The Panoramic Survey Telescope and Rapid Response System (Pan-STARRS)-1 uses a 1.8-m wide-field telescope to carry out several wide-area surveys from Haleakala; in the future, they hope to deploy 4 × 1.8-m telescopes at Mauna Kea in Pan-STARRS-4. The Dark Energy Survey (DES) will use a new 3 sq. deg. imager with red-sensitive CCDs on a 4-m telescope at Cerro Tololo Inter-American Observatory (CTIO) in Chile to carry out a 5,000 sq. deg. survey in 5 optical passbands, covering the same survey area as the SPT and partnering with the ESO VISTA Hemisphere Survey which will survey the same area in 3 near-infrared bands. Hyper Suprime-Cam is a new wide-field imager planned for the Subaru telescope on Mauna Kea that will be used to carry out a deep survey over 2000 sq. deg. The Advanced Liquid-mirror Probe of Asteroids, Cosmology and Astrophysics (ALPACA) is a proposed rotating liquid mercury telescope that would repeatedly survey a long, narrow strip of the sky at CTIO. The most ambitious of these projects is the Large Synoptic Survey Telescope (LSST), which would deploy a multi-Gigapixel camera with 10 sq. deg. field-of-view on a new telescope on Cerro Pachon in Chile to survey 15,000 sq. deg. over 10 years. Table 3. Dark energy projects proposed or under construction. Stage refers to the DETF time-scale classification. Several large spectroscopic surveys have been designed to detect baryon acoustic oscillations by measuring ~ 105 - 109 galaxy and QSO redshifts using large multi-fiber spectrographs. WiggleZ is using the Anglo-Australian Telescope to collect spectra of 400,000 galaxies in the redshift range 0.5 < z < 1. The Baryon Oscillation Sky Survey (BOSS) proposes to use the SDSS telescope in New Mexico to measure galaxy spectra out to z = 0.6. The Hobby Eberly Telescope Dark energy EXperiment (HETDEX) plans to target Ly- emitters at higher redshift, 2 z 4. The Wide-Field Multi-Object Spectrograph (WFMOS), proposed for the Subaru telescope, would target galaxies at z 1.3 and Lyman-break galaxies at 2.5 z 3.5. The Physics of the Accelerating Universe (PAU) is a Spanish project to deploy a wide-field camera with a large number of narrow filters to measure coarse-grained galaxy spectra out to z = 0.9. Finally, the proposed Square Kilometer Array (SKA), an array of radio antennas with unprecedented collecting area, would probe dark energy using baryon acoustic oscillations and weak lensing of galaxies via measurements of the 21-cm line signature of neutral hydrogen (HI). The Hubble Sphere Hydrogen Survey (HSHS) aims to carry out a 21-cm BAO survey on a shorter timescale. Three of the proposed space projects are candidates for the Joint Dark Energy Mission (JDEM), a joint mission of the U.S. Department of Energy (DOE) and the NASA Beyond Einstein program, targeted at dark energy science. SuperNova/Acceleration Probe (SNAP) proposes to study dark energy using a dedicated 2-m class telescope. 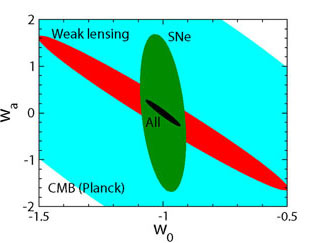 With imaging in 9 optical and near-infrared passbands and follow-up spectroscopy of supernovae, it is principally designed to probe SNe Ia and weak lensing, taking advantage of the excellent optical image quality and near-infrared transparency of a space-based platform. Fig. 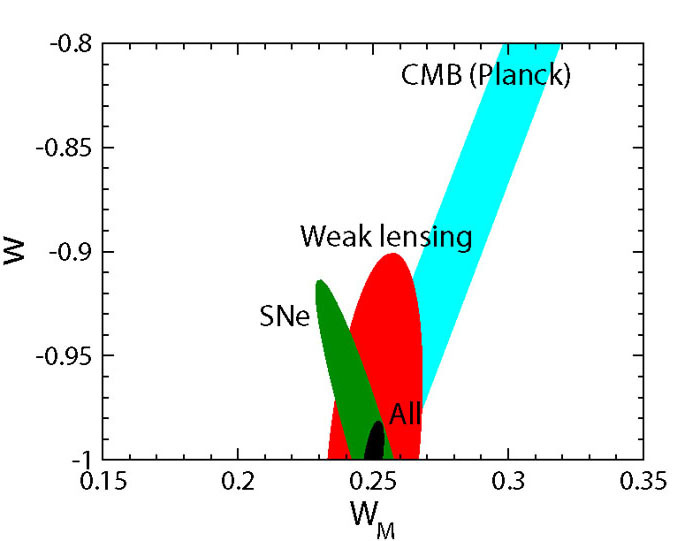 17 gives an illustration of the statistical constraints that the proposed SNAP mission could achieve, by combining SN and weak lensing observations with results from the Planck CMB mission. This forecast makes use of the Fisher information matrix described in the Appendix (Section 11.2). The Dark Energy Space Telescope (DESTINY) would use a similar-size telescope with a near-infrared grism spectrograph to study supernovae. The Advanced Dark Energy Physics Telescope (ADEPT) is a spectroscopic mission with the primary goal of constraining dark energy via baryon acoustic oscillations at z ~ 2 as well as supernovae. Another proposed mission within the NASA Beyond Einstein program is Constellation-X, which could observe X-ray clusters with unprecedented sensitivity. Figure 17. Illustration of forecast constraints on dark energy parameters. Shown are 68% C.L. uncertainties for one version of the proposed SNAP experiment, which combines a narrow-area survey of 2000 SNe to z = 1.7 and a weak lensing survey of 1000 sq. deg. Left panel: Constraints in the M - w plane, assuming constant w; the vertical axis can also be interpreted as the pivot value wp for a time-varying equation of state. Right panel: Constraints in the w0 - wa plane for time-varying dark energy equation of state, marginalized over M for a flat Universe. There is one European Space Agency (ESA) mission nearing launch and two concepts under study. The Planck mission, planned for launch in late 2008, in addition to pinning down other cosmological parameters important for dark energy, will detect thousands of galaxy clusters using the SZE. Dark Universe Explorer (DUNE) and SPACE are optical missions to study dark energy using weak lensing and baryon acoustic oscillations, respectively. Finally, the extended ROentgen Survey with an Imaging Telescope Array (eROSITA), a German-Russian collaboration, is a planned X-ray telescope that will study dark energy using the abundance of X-ray clusters.